Home / Technical Articles / Where to start with design of electrical installation? The power analysis must be always the at the very top of your tasks in design of an electrical installation. It will enable the source(s) to be sized according to the purpose of the installation, the intended use of the circuits and the receivers to be supplied. Selection of the appropriate electrical devices and equipment. Power analysis and calculation should be done from downstream to upstream as well as from upstream to downstream (Figure 1). 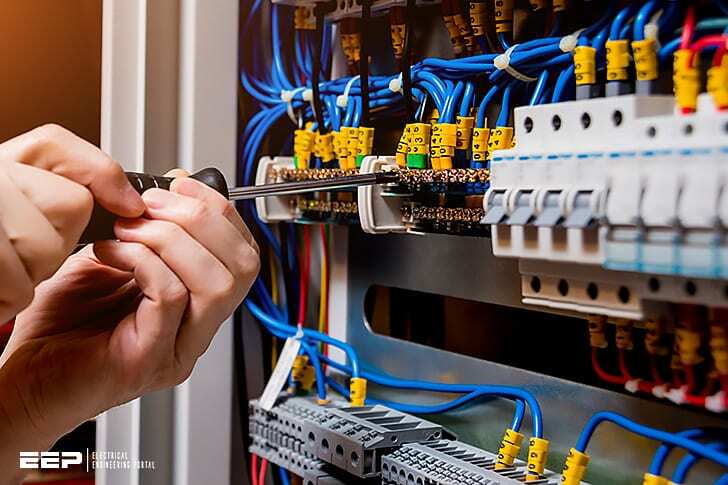 The loads supplied by the electrical installation can be of various types depending on the business: motive power, variable control units, lighting, IT, heating, etc. Depending on the individual case, the electrical operating parameters (phase shift, efficiency, inrush transients, harmonics, etc.) will be different. The power to be considered is not limited to the simple reading of a value in watts. Reactive power (inductive loads) and also distorting power (loads consuming a non-sinusoidal current) must be included and may have a significant adverse effect on the energy efficiency of the receivers in question. An observation that will lead to “compensating” for these unnecessary and non-recoverable losses, which are also costly, using compensation measures such as capacitors or filters. All electrical receivers consume a total or apparent power S (expressed in volt-amperes or VA) equal to the product U × I. The same unit is used to express the power that the generator or transformer must be able to supply. But as its name indicates, this power is only apparent and it is not necessarily used in an optimum way. Part of it does not produce any work or heat. This is the reactive power Q (expressed in volt-amperes reactive or VAR), which is essentially due to the magnetization of the magnetic circuits. This wasted energy is generally billed by the electricity supplier and it causes additional currents to flow which must be taken into account in the sizing of the installation. Non-linear loads (those which consume a non-sinusoidal current which is not a reflection of the voltage) require the introduction of an additional concept of loss called the distorting power D, which will in addition to the unnecessary power consumed, introduce real “pollution” of the mains supply. Until recently, loads were more or less linear, i.e. the current consumed was sinusoidal and reflected the voltage applied, even if they were out of phase. The cos ϕ was therefore often likened to the power factor and the two were often confused, although they are totally separate characteristics. The cos ϕ characterises a time shift of the sinusoidal signals (characterised by an angular displacement in the vector diagram) whereas the power factor is the ratio of the active and apparent power values. This comparison, which was not mathematically incorrect, can no longer be made as modern loads (electronic power supplies, compact fluorescent bulbs, etc.) are often non-linear and consume a new form of power known as distorting or harmonic power, that the cos ϕ does not express. If the loads are not sinusoidal, which is almost always the case in modern installations, the cosine ϕ must not be confused with the power factor. The phase shift between P and S can be different from that between U and I due to the introduction of distorting loads. We will therefore keep to the use of the power factor or λ = P/S here. The tan ϕ (tanϕ = P/Q ) will be used for the calculation of the reactive compensation power. The active power P and reactive power Q are added together. The sum S of the apparent power is calculated. In electrical networks, the voltage and current waveforms are not purely sinusoidal. This distortion is due to the presence of loads with non-linear characteristics. These loads consume non-sinusoidal currents thus causing a distortion of the current wave. The greater the number of non-linear receivers, the higher the distorted currents and the more visible the effect on the voltage wave, thus causing deterioration in the quality of the energy distributed. There are two types of harmonic wave: the current wave and the voltage wave. At the origin, devices with non-linear circuits distort the fundamental current and generate harmonic currents. These currents, circulating in the installation, cross impedances and cause harmonic voltages. It is the total harmonic distortion of the voltage wave that will be used to define the degree of pollution of the installation. On the other hand, it is the measurement of the total harmonic distortion of the current wave that is used to detect the sources that are at the origin of this pollution. The distorted wave is represented mathematically by the “fundamental” wave at a frequency of 50 Hz, on which a certain number of sinusoidal waves are superimposed, each with a frequency that is a multiple of that of the fundamental wave. These waves are called harmonic waves. They are identified by their order (integer) which is the ratio between their frequency and the fundamental frequency. They are defined by their amplitude in relation to the fundamental wave. In order to quantify and represent these phenomena, a mathematical calculation called “Fourier analysis” is used. This enables any periodic signal to be represented in the form of the sum of a fundamental wave and additional waves, the harmonics, whose frequency is a multiple of the fundamental. There are even-order and odd-order harmonics. Odd-order harmonics are frequently found in electrical networks. Even-order harmonics cancel each other out due to the symmetry of the signal. Most loads connected to the network are symmetrical (the current half-waves are equal and opposite). The total even-order harmonic distortion is generally zero. Three-phase, balanced, symmetrical, non-linear loads, with no connection to the neutral do not generate any 3rd order harmonics, or any harmonic orders that are multiples of 3. These cancel each other out in the triangular load circuit. Three-phase, balanced, symmetrical, non-linear loads, with connection to the neutral generate 3rd order harmonic currents and harmonic currents in the neutral conductor in orders that are multiples of 3, which are added together arithmetically. The rms value of the neutral current can therefore be greater than that of the phase current and can theoretically reach √3 times the value of the current in one phase. To remedy the overload of the neutral conductor, the simplest solution is to increase the cross-section of this conductor (doubling it) from a certain level of harmonic distortion. Other solutions would be to use zigzag connection reactors or harmonic filters tuned to the third order harmonic. Observation using an oscilloscope clearly shows a distorted signal which no longer looks very much like a sine wave in certain cases. Historically, harmonics (3rd order and its multiples) were mainly due to saturation of the magnetic circuits and were very limited. The advent of single-phase diode rectifiers with capacitor filters had significantly increased the level of 3rd order harmonics, which can reach 80% of the fundamental. Numerous modern devices generate harmonics of many different orders. All devices with a single-phase rectified supply followed by switching (3rd, 5th and 7th orders): TVs, computers, faxes, lamps with electronic ballast, etc. Single-phase AC power controllers using variation of the phase angle (3rd, 5th and 7th orders): variable control units, controllers, starters, etc. Equipment using arcs (3rd and 5th orders): furnaces, welding, etc. Thyristor power rectifiers (5th and 7th orders): power supplies for variable speed motors, furnaces, UPS, etc. Machines with magnetic circuits, if the circuit is saturated (3rd order): transformers, motors. etc. Controlled arc lighting devices (3rd order): lamps with electromagnetic ballast, high pressure vapour lamps, fluorescent tubes, etc. 3rd order harmonics have the advantage of being added together in the neutral conductor, which of course increases the current circulating in that conductor, but also significantly limits the effects of pollution on the network. Modern electronic loads generate much higher order harmonics. The first 25 and even the first 50 orders are commonly measured. But certain technologies involving HF chopping of the signal go considerably beyond this (500th order), posing new, very specific measurement problems. The presence of harmonics in the installation has consequences connected with the peak values (dielectric breakdown), the rms values (additional temperature rise) and the frequency spectrum (vibration and mechanical wear) due to the harmonic voltage and current waves. The effects can be divided into two types: instant, short-term effects and long-term effects. These both have an economic impact on the operation of the installation following deterioration of the energy efficiency, destruction of certain devices, oversizing of certain equipment and probable production losses. In the longer term, the presence of harmonics has a mainly thermal effect. The current overload causes additional temperature rises and consequently premature ageing of equipment. D is difficult to calculate as it represents the geometric sum of the power corresponding to each of the harmonic orders, for which both the value and the inherent phase shift angle must be known. The distorting power D is not therefore generally calculated itself. The power diagram is reduced to the three vectors P, Q and S. The part of the distorting power D is calculated from the active power using the power factor that will be downgraded. The resulting increase in power S (VA) will require the provision of an accordingly sized source. The application of an increasing factor on current Ib according to the total harmonic distortion (THD) may possibly result in choosing larger size conductors and in particular the neutral conductor. In installations where the distorting component is very high (data centres, shopping centres, etc.) passive or active filters can be installed to correct the distortion of the signal. Reactive energy is generally billed by the energy supplier. It also causes an increase in heat losses, end of line voltage drops and limits the available active power. 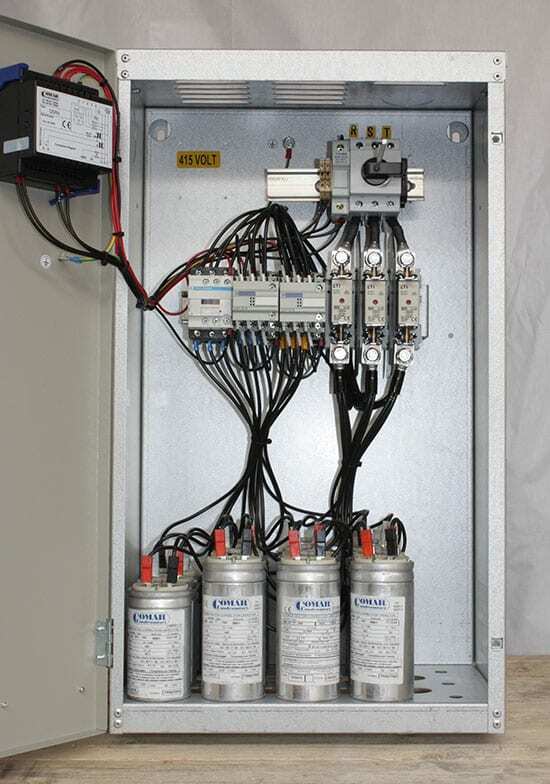 It is therefore important to set up a compensation system consisting of capacitor banks adapted to the installation, but above all it is essential to balance the installation in terms of types of load and current consumed on each of the phases of the three-phase network. This is the operation that associates the analysis of the loads with the determination of the power of the source. The calculation of the currents is also essential for determining the conductors and protection devices. In the context of the power analysis, this calculation takes account of the whole installation and its operating conditions (load factor, simultaneous operation of the various circuits) while incorporating the characteristics of each receiver (efficiency, cos ϕ). The actual operating current IB which is used to calculate the trunking and protection devices can be reduced by applying factors that will provide the closest approximation to the actual operation of the installation and avoid oversizing. These are the utilisation factor (Ku) and coincidence factor (Kc). Conversely, the actual current can be increased by a factor η linked to efficiency (for example, motors) or by the displacement factor (cos ϕ) connected with the inductive or capacitive nature of the load. Consumption of non-sinusoidal currents (harmonics) can also lead to an increase in the actual operating current. In all these cases, busbars and protection devices must be oversized for this increase in current, which does not correspond to an increase in the active power in W.
The normal operating state of a receiver is generally such that the power it uses is less than its nominal power, this is the concept of utilization factor. This can be checked for example for motorized receivers that are likely to operate below their full load. For example in industry an average value of 0.75 is taken into consideration for motors. For lighting and heating, a value of Ku = 1 will always be set. For power sockets, this must be assessed according to their purpose. The utilization factor is applied individually to each receiver or each load circuit. Reducing the current by applying the Ku factor does not under any circumstances allow the sizing of the conductors to decreased. Conductors must always be sized to withstand the nominal current IB corresponding to the current Ia consumed by the receiver(s) or to the maximum current In of the protection device specific to the circuit in question. Not all the receivers in an installation operate at the same time. This would obviously lead to unnecessary oversizing. For this reason a reduction factor, known as the coincidence factor, can be applied to the sum of the currents of the various receivers (or circuits). The value of this reduction factor is generally determined based on the number of circuits that can operate at the same time. The greater the number of circuits, the more the calculated total current can be reduced by the Kc factor. The IEC 60439 series of standards, which are undergoing revision, propose generic values for the coincidence factor. by integrating each of the KU factors specific to each circuit. The conductors and protection devices of the circuit travelled over by the total current Ib can be sized for the calculated value of this current. It is not necessary to carry out this sizing for the theoretical sum of the currents IB. In most secondary or terminal distribution panels, it is necessary to distribute three-phase and single-phase circuits. Some can supply receivers directly (direct outgoing lines) or supply points of use or small modular consumer units. In this case, it is not possible to keep to a single rule to determine the coincidence factors. while the 2nd level of distribution can be determined with the Kc values in accordance with standard IEC 60439-3. For the 3rd level or terminal level of distribution which is not implicitly described in standard IEC 60439, the coincidence factors in IEC 60364 must be applied, in particular for circuits of 16 A sockets. Values of Kc Standards IEC 60439-1, IEC 60439-3 and IEC 60364 give generic values for this factor. The assembly manufacturer must consider the exacts conditions of operating to define and give the coincidence factor for groups of circuits and for the whole assembly. Coincidence factor (Kc) for main distribution board, distribution panel (LV industrial distribution in accordance with standard IEC 60439-1) if the load conditions are not known. Coincidence factor (Kc) for distribution board < 250A (for commercial use in accordance with standard IEC 60439-3) if the load conditions are not known. Coincidence factor (Kc) for secondary or terminal cubicles (for residential or small business use) in accordance with standard IEC 60364 section 311.3. (**) The current to be taken into consideration is equal to the nominal current of the motor, increased by a third of the starting current. It is not possible to calculate all power in the same way, as they are of differing types (resistive, inductive, distorting). The current consumed Ia corresponds to the nominal current consumed by a receiver independently of the utilization factor and the coincidence factor, but taking into account the aspects of efficiency (η factor), displacement factor or phase shift (cos ϕ) for motors or other inductive or capacitive loads. For non-linear (or distorting) loads, the quadratic sum of the fundamental current and the harmonic currents must be calculated in order to obtain the actual rms current. Detailed calculation is covered in this technical article. The power of the source can generally be sized at a much lower value than the sum of the power of all the receivers. This is the main objective of the power analysis. The determination of the optimum and adequate power of the source or sources is an operation that can have considerable consequences in terms of reliability and operating cost. 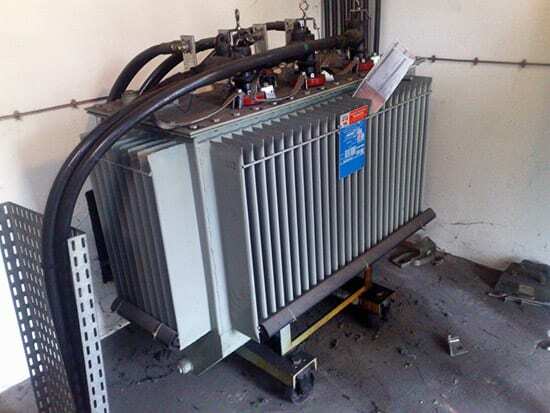 It generally involves an HV/LV transformer for which it must be remembered that undersizing may result in virtually continuous operation at full load or even overload, which can cause premature ageing of the insulation as well as the risk of tripping and more or less lengthy stoppage. On the other hand, oversizing involves excessive expenditure and unnecessary no-load losses. However, on-load losses my be significantly reduced if the continuous load is high. The calculation is performed by taking the active power (kW) of the different receivers or terminal circuits. To find the absorbed current Ia, the apparent power S (kVA) is calculated using the power factor PF. The utilization factor Ku is then assigned to each of the circuits to determine the actual use current Ib. Caution, the ducts need to be dimensioned for the nominal current IB corresponding to Ia. The currents are summed for each distribution panel (or for circuit groups accordingly) by assigning a coincidence factor Kc. In the above example, the calculated power is 224.9 kVA for a current of 326 A. The economic choice of a smaller model (e.g. 200 kVA – 275 A) would require reworking of the calculation assumptions with a possible tripping risk. The required power supplies can be determined based on the criteria for definition of the installation (receivers, power, location, etc.) and the operating conditions (safety, evacuation of the public, continuity, etc.). This is intended to supply the installation continuously. It generally comes from the public distribution network. The choice between high and low voltage is made according to the power requirement. This is intended to maintain the power supply by supplying the necessary energy to ensure safety of the site in the event of failure of the main and/or replacement power supply. Other safety installations such as remote control systems, telecommunications, equipment involved in the safety of people (lifts, emergency lighting, operating theatre, etc.). They are characterized by how they are switched on (automatic or manual) and their stand-alone operation. This is intended for the operation of “auxiliaries” (control and signalling circuits and devices). It is provided by a separate source which may or may not come from the main power supply. Its independence gives the installation a degree of operational safety. It often has a different voltage or is of a different type from the main power supply. When it is protected and it meets certain criteria (power, standalone operation, etc.) it can be similar to a power supply for safety services. This article helps me a lot about my work as a college professor. Thanks a lot. Keeping in touch.